We were flying along producing about 400 units an hour when, after four uneventful hours of production, the system started faulting out. The closest maintenance person went through the usual procedures. He laboriously unloaded the work-in-process, lowered operating parameters to process initiation values, re-instructed the operator (me) to slow down. After four or five minutes of effort, he got the machine fired back up. And it promptly faulted out again. The process was repeated and the machine faulted out AGAIN. The old timer was at lunch. He was called. If you are like most folks you are going "Ah-ha! They overworked the machine. They kept focusing on increasing throughput and broke the machine." There are two pieces of evidence that make that root-cause unlikely. The machine worked fine for four hours! Why didn't the machine fault out in the 14,400 seconds that we were pouring the coal to it? Modern machinery measure load as current. Approaching stall causes "in-rush" current because the inductive component of the load disappears. In-rush currents are typically two or three times operating current. The other piece of evidence was that the machine did not take off under zero load. All the material had been pulled off the system. All start-up parameters were set to zero. And the maintenance guy still had to fiddle with it another four or five minutes. The other possibility was an over-temperature condition in the motor. 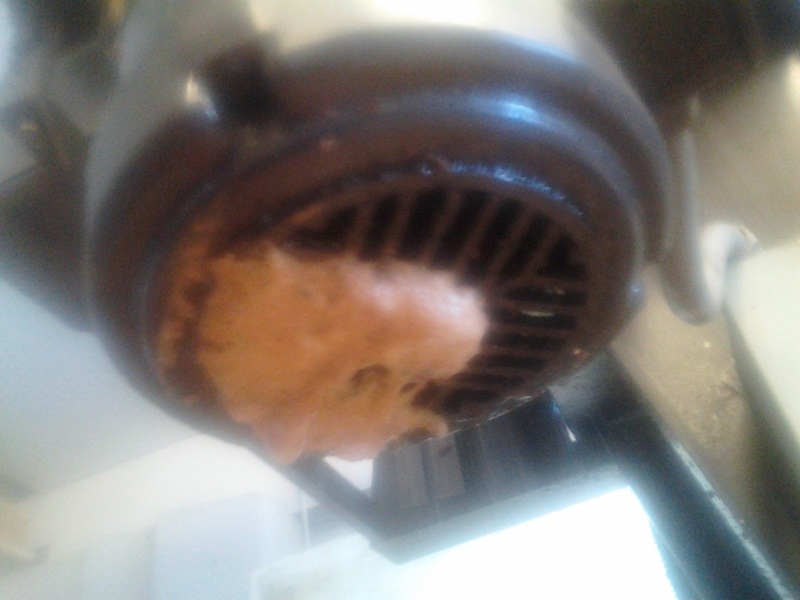 The reason the maintenance guy's routine worked is because it gave the motor some time to cool off. Well, for one thing the case of the motor was hotter than a popcorn fart. This is a typical industrial, electric motor. Notice that the cooling air does percolate through the stator and rotor. Rather, it cools from the one end and through the case. 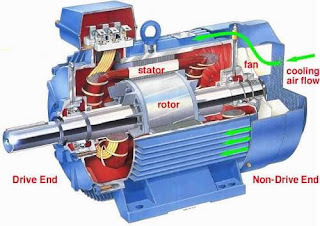 Also typical of high duty-cycle, industrial motors, this motor has cooling fins cast into the motor casing. Another thing was that it was kicking out almost no cooling air. The motor is in an inaccessible position. It is difficult to see this end of the motor. The motor in question is not in an optimal position. Organic mud collected on the air intake and probably gummed up the fan blades. Air flow was still weak, even after the air intake screen had been cleaned. A couple of longer term fixes would be to clean out the cooling end of the motor, re-orient the motor so the cooling end was farther way from the cruddy mist. A nice touch would be to find a collar of clamp-on, extruded heat sink material. I did not measure the OD of the motor can but it looked like about 8". Any leads from my readers will be much appreciated. The final part of the puzzle is "Why did it run four hours?" The probable answer is that the organic mud shrank when it dried out. Four hours of soaking up mist caused it to swell enough to drive the final nail in the coffin. This motor is plenty of motor, it just needs some TLC and to be spun away from the dirt. ERJ, what does the motor drive? Is it belt, chain or direct- driven? Does the mechanical load remain consistent? What type of starter- - -is it a full load starter or a soft start or VFD? What was the failure mode- did a starter overload open the motor circuit? (That would be common, indicating too much heat in the motor wiring, usually from excess drag or load). In a past life, our maintenance department had spares, and would just swap out the motor. The General would not tolerate down time. The root cause of the failure would be done on a bench, after the system was back in operation. If the luxury of a spare is not available, pulling the fan cover and removing whatever inhibits proper air flow would be the first step. Locating any binding in the driven load and removing it next and reorientation of the motor to give it unobstructed free air would be next. Also, our totally enclosed fan cooled motors ran hot always. Maybe not popcorn-fart hot, but probably in the range of 120-140 farenheit. I believe it drives a 90 degree, gear set-up, and then belts. Tension in the belts is controlled pneumatically. Mechanical load varies but not much shock. Looks like capacitor start with RPM throw-out. Not much inertia in the driven system so it comes up to speed almost instantaneously. Not VFD. Overloads did not occur on start-up but during normal operation. Some were "saved" by hitting restart. Other times it did not fire back up. So, did you work in trucks in the north part or metal stamping in the middle? I started in the truck group running projects at all 13 (at the time) truck plants. Did not survive that crash in 2008.